Buy Canon LBP2900B Laser Printer @ 10% Discount. By harnessing the power of Canon Advanced Printing Technology (CAPT) and Hi-SciA (High Smart Compression Architecture), this printer is able to process image data faster than conventional printers. What Hi-ScoA does is compressing print data into smaller sizes for quick transferring from computer to printer with CAPT. The result is good print speeds without any expensive printer memory upgrades. Get quick quality results with no wait time, thanks to Canon's exclusive On-Demand Fixing Technology, which transfers heat instantly when activated. 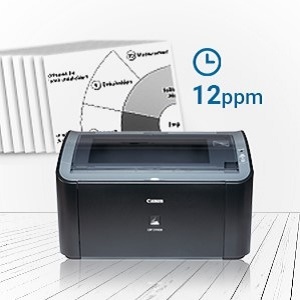 Quick Warm Up time enables the printer to respond quickly from Standby Mode, delivering fast. The compact design, 45.5 x 35.6 x 34.6 cm, of the Canon Laser Shot printer enables you to fit it in any small space of your home or office. It is packed with Canon Cartridge 303 that can print up to 2,000 prints on A4 sized paper with crisp and clear output. Get those urgent documents in a jiffy, with the On-Demand Fixing Technology which is Canon’s exclusive feature. It is engineered to give fast prints, with quick warm up and first print can be executed with in 10 second of power up. Fitted with USB 2.0 interface, the Canon Laser printer is easy to connect and install. It is compatible with Windows XP, 2000, ME, 8 and LINUX (CUPS). It has power consumption between 220 V to 240 V. It comes with Cartridge 303, Power Cord, Getting Started Guide and User Software CD ROM. Canon Laser Shot LBP 2900B is one office supply you cannot do without. The Canon Laser Shot LBP 2900B laser beam printer is a single function printer, perfect for small office environments. This cutting edge printer comes with automatic image refinement technology (AIR), which smoothes out the rough edges on texts and graphics to give a high print resolution. Canon Laser Shot LBP 2900B laser printer uses a single Canon cartridge that can print up to 2000 prints of A4 sized papers. While it may look like a compact unit, the Canon Laser Shot LBP 2900B is designed for high performance. 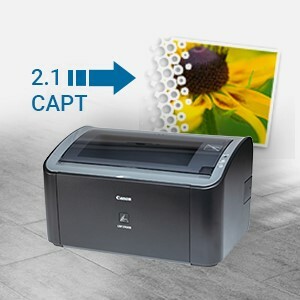 This Canon laser printer has advanced features like CAPT 2.1 (Canon Advanced Printing Technology) that allows the printer to process data faster and deliver crisper prints. With an enhanced resolution of 600 x 600 dpi and the AIR technology, the prints are smoothed up to 2400 x 600 dpi. This Canon LBP 2900B laser printer features Canon’s exclusive On-Demand Fixing technology for printing urgent documents. The first print is out in approximately 9 seconds with a quick warm up time of less than 10 seconds after power up. Get instant laser-quality prints with hassle-free operations using the Laser Shot LBP 2900B from Canon. Print crystal clear monochrome documents, presentations and lots more in superb laser quality. 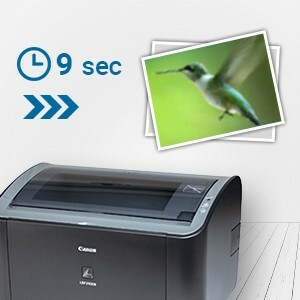 This Canon LBP 2900B printer delivers high-speed output at the rate of 12 pages per minute on A4 size paper. You can also plug in other portable devices to this printer and print the stored data using Hi-speed USB 2.0. Connect this Canon LBP 2900B printer supports all the latest operating systems including Windows 8/ME/2000/XP, Linux (CUPS). Best Cheap Deals For Canon Printer & Scanner, Grab Cheap Canon LBP2900B Laser Printer Online.